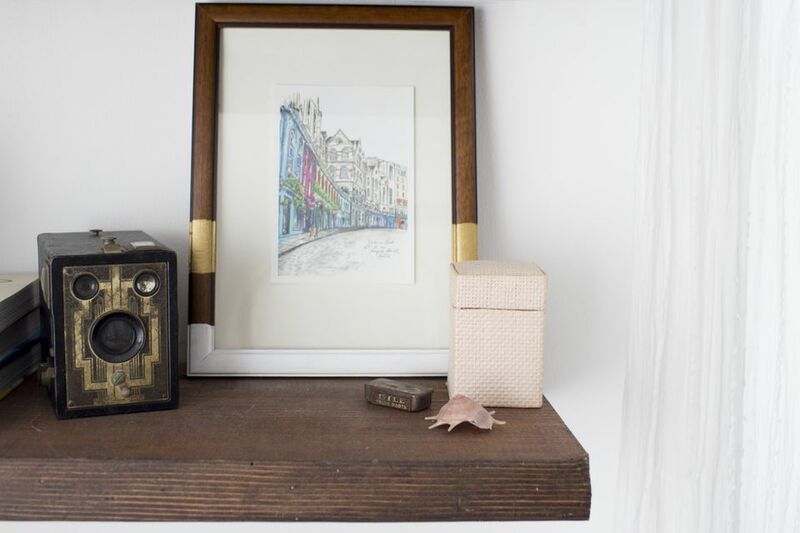 One of the easiest and cheapest items you can find at a thrift store are old frames. If you buy a bunch of them, it can make creating a gallery nice and simple—not to mention affordable. 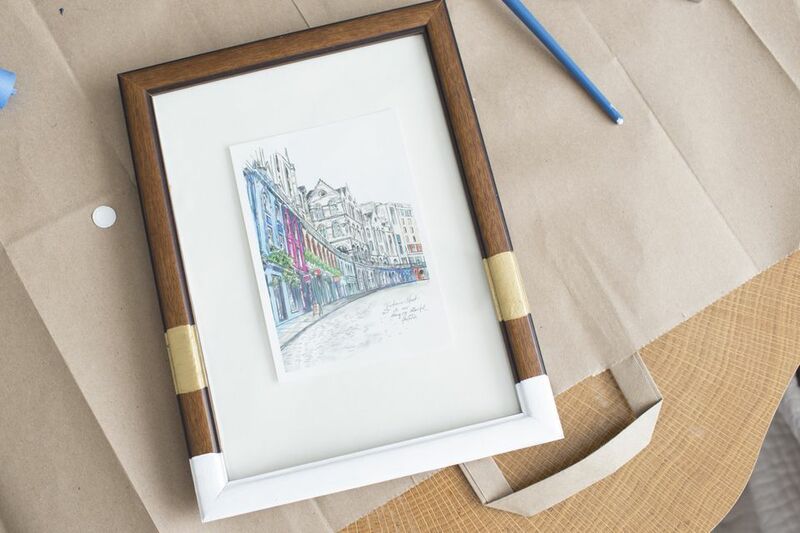 So avoid store bought frames that can be expensive and just roll up your sleeves instead! If you’re willing to do a little bit of work, you can easily update the look and feel of some of the more traditional looking frames. Follow this tutorial exactly to get the look of our frame, or improvise to create your own unique look! The first thing you’ll want to do is take your frame apart. It makes it easier to paint if you’re not worrying about getting smudges of paint on the glass. Depending on what the back of your frame is like, you’ll most likely need a screwdriver to get the back of the frame off. Old frames can be held together with all sorts of things, so just be careful not to scratch yourself on any rusty screws or fasteners. Set aside everything but the wooden frame until later in the process. Grab a long piece of painter’s tape and tape it across the bottom of your frame—but maybe about an inch and half higher than the actual bottom. You want the bottom of the edges of the frame to get some color too. Really press the painter’s tape down so it’s covering every groove and edge. Once your tape is firmly in place, paint the first layer white. You could use spray paint for this, but honestly craft paint is fine. If your frame is in bad condition, it might not be a bad idea to lightly sand, clean, and then paint. If you’re using craft paint and a regular brush, do a light layer first, wait for it to dry slightly, and then go over it again with a second layer until you’re satisfied with how it looks. Once your first layer is completely dry, remove the painter’s tape. Now use a new piece of tape to block off where you’ll want your gold accent lines. Again, make sure the tape adheres to every section of the frame so there are no gaps. Once you’ve started painting, if you’re feeling comfortable, you can remove the painter’s tape and continue painting. Let these paint lines dry completely before putting the frame back together and hanging. You can use this same technique to cover any old frame or you can do more than one frame with different colors or patterns. When they’re all hung on a gallery wall, it’s sure to make an impact.